I have been wanting to try making a souffle for a while now. They have seemed a bit intimidating and I had been holding off but when I saw this recipe for an asparagus souffle I just had to try it. I had a lot of fresh local asparagus and this sounded like a perfect way to enjoy some of it. I cut the recipe back a bit as I only had 4 ramekins. I was not sure if playing with the ingredient ratios was a good idea given that souffles are supposed to be a bit challenging to make. This souffle is basically a puree of asparagus mixed into a bechamel sauce that is then folded into some beaten egg whites. I have made bechamel and beaten egg whites several times so the souffle actually came together fairly easily. The ramekins that contain the souffle are in hot water while cooking and this is called a bain marie. I was pleased to see that the souffles puffed up nicely while cooking and I pulled out my camera right away. The souffle deflated quite quickly as I was taking pictures. Souffles are even harder to photograph that melting ice cream! The asparagus souffles were super light and fluffy and moist and good! They did not end up with the dark green colour that I was hoping for but they were really tasty. I think that the next time I make them I will use more asparagus. I really enjoyed the souffle and I now look forward to experimenting with different flavours, both savoury and sweet. Butter and coat the ramekins with the bread crumbs. Boil the asparagus until just tender. Run the asparagus under cold water to stop the cooking process. Add the shallot and saute until just tender, about 3-5 minutes. Add the garlic and thyme and saute until fragrant, about 1 minute. Puree the asparagus, and shallots in a food processor. Add the flour and stir to mix. Add the milk, egg yolks, nutmeg, mustard, salt and pepper and whisk until it thickens. Add the cheese and mix it in as it melts and remove from the heat. Mix the cheese mixture and asparagus mixture together. Beat the egg whites in a bowl until just stiff. Fold the egg whites into the cheese and asparagus mixture. Pour the batter into the ramekins, place the ramekins into a baking dish and fill the baking dish with hot water up to half the height of the ramekins. Bake in a preheated 400F/200C for 10 minutes, reduce the heat to 350F/180C and bake for another 15 minutes. Take a look at the In The Bag roundup on Real Epicurean. Kevin I love Asparagus, are delicious! and you, is the first time you make this??? amazing!! I’m DEFINITELY intimidated by the idea of making a souffle; but wow, you make it look so easy!! It looks FANTASTIC!! Oh man, this sounds (and looks!) so good… I love asparagus and I have yet to attempt a souffle. I’ll bet the texture is amazing. Very nice! Big fan of the addition of nutmeg…yum!! Kevin…do you ever stop cooking;)? Congratulations on your souffle success! I’ve never made one myself–I know I’d mess it up. Yumm, looks great Kevin. I know what you mean about being hard to capture on film (err.. compactflash). Nice job! Kevin, as if you have ever stepped back from a challenge…..these souffles look delicious. Dude, do you have a day job? Beautiful souffle. You’re a real trip, you know that? Kevin – As I was reading this I thought – I hope you have submitted this to in the bag. Its a great recipe and looks delicious. Have printed off the recipe to try out! That sounds awesome! I’m always looking for new ways to use asparagus – thanks! I haven’t made a souffle in a long time. And now I think I’ll correct that, since seeing that delicious picture. perfect size in a ramekin. The souffle looks lite as it should be and would be really flavourful with the asparagus. I’ve never tried making a souffle. Too scary. “Harder to photograph than melting ice cream”, that made me laugh! What blogging does to us! Your soufflé looks delicious Kevin, I just love asparagus. Oh what a beauty! I had to laugh as I imagined you with your camera in position as it came out of the oven! Well done, I’m suitably impressed! My hat’s off to you, Kevin. A souffle is an ambitious undertaking and you did it beautifully. Great Job! I could eat this anytime of day. A perfect use of asparagus Kevin. You never fail to please. Yes, souffle is so intimidating!!! I have never tried to make one of my own.. I’m sure I’d burn it! Sei bravo Kevin! i agree. souffles are intimidating but they sure are yummy! Those are a lot of instructions! But the final result looks so worth it. Mmm! im too scared to try making souffles. 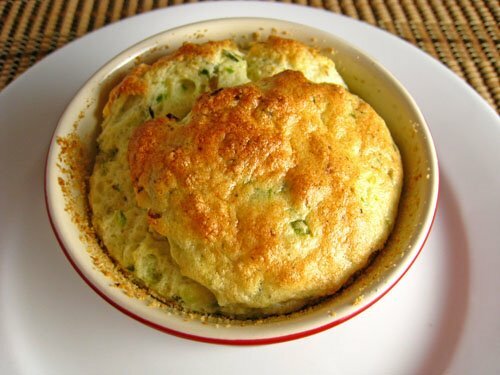 asparagus souffle sounds great! wow! Wow Kevin , looks great. I made one in September , I guess, and I love the taste. Wonderful job Kevin, it looks golden, fluffy and savory! I’m so nervous about making souffle, but I’ve always wanted to try! These look delicious, Kevin! I’ve never made a souffle. This sounds really great though… the idea of using asparagus. Your directions are very direct and clear. They will definitely be useful if I ever get around to trying a souffle of my own. I have always wondered how difficult it would be to photograph a souffle! This sounds so delicious, though – and I’ve been seeing some great asparagus lately! lol… I’ve had a tough time photographing souffles before too. It’s almost better to photograph them while they’re still inside the oven! Asparagus finds it’s way into my cart every trip to the grocery store. Thanks for this and the asparagus mushroom quiche recipe! this may be one of the best things you’ve made on this blog (to me only b/c i love both souffle and asparagus! beautiful job. gorgeous. I made aspargus souffle too for In the Bag, but I like yours better. This is absolutely WONDERFUL! At first I was unsure if it was done because the souffles turned out pale green and not brown at the top. My friends loved them and I would definitely make them again. A note: the process is very convoluted. Make sure you read all directions and keep an eye on all pots–especially if you are cooking an entire meal. Yum another delicious looking thing on your blog! I’ve never had a souffle before. I made a version with chopped asparagus and sauted mushrooms – also very good.